What a progressive trade agreement would actually look like. Of the many big promises candidate Trump made, there’s one even a tax-dodging billionaire can’t afford to break. The North American Free Trade Agreement (NAFTA), the Clinton-era trade accord linking Canada, Mexico, and the United States that Trump dubbed the “worst deal” in history, symbolizes for millions of workers everything wrong with the neoliberal global economic order, and Trump convinced millions of voters that he alone could fix it. Labor, environmental, and consumer advocates hope the talks could initiate a move toward crafting a more cooperative, socially protective trade policy that reins in the power of multinationals rather than boosting their transborder impunity. Now a coalition of environmental, labor, consumer, and community organizations is seizing the opportunity to advance a NAFTA replacement blueprint, which attempts to remedy some of the social problems that trade was supposed to fix but, in many cases, only deepened: economic fairness, ecological sustainability, and corporate responsibility. Yes, Trump’s Against Free Trade. That Doesn’t Mean He’s For Good Jobs. But rules are only as good as their enforcement. For corporations that cut corners, activists want to scrap the current quasi-legal system known as the Investor State Dispute Settlement process. This tribunal structure enables corporations to litigate outside domestic courts against regulations seen as unfairly restrictive on business, like environmental protections and safety rules, and seek financial damages. Replacing the tribunals with a more open judicial process would empower civil-society and labor groups to check multinationals’ efforts to subvert domestic laws. The major case for a NAFTA overhaul is simply that the rules are outdated. NAFTA was enacted decades before workers or even politicians anticipated the explosion of the gig economies, the explosion of digital technology, or threats of financial collapses, pandemics, or climate change. The interests at stake in a massive trade deal like NAFTA vary from tariffs to pollution controls—but all civil-society groups demand more leverage to hold multinationals to basic rights standards that would help all trading nations adapt to global economic changes. Labor unions want to protect jobs and livelihoods however industry evolves. Currently under NAFTA there are few mechanisms for workers and labor groups to raise grievances against multinational corporations for labor violations, which undermines corporate accountability across the supply chain. Instead of a race to exploit lax labor standards and low wages around the world, both US and international labor groups want to ensure a “level playing field” for all economies with binding regulations on all multinationals on wages, occupational safety and health, and freedom to organize. On the environmental front, groups like Friends of the Earth and the Sierra Club want a greater say in ensuring that future cross-border trade is based on shared environmental standards, which most past trade deals have either ignored or treated as an optional or voluntary provision. If NAFTA forced trading partners to harmonize their climate standards for manufacturing, for instance, the whole region could coordinate its industries around the mandates of the Paris Climate Treaty, with countries holding one another accountable to international emissions targets. In its recommendations for a NAFTA replacement, the Sierra Club points out that the current accord obstructs governments from enforcing their own emissions standards through its draconian quasi-legal tribunals. However, a restructuring of trade regulations actually advances global climate-mitigation efforts by requiring procurement in green industries or incentivizing subsidies for renewable-energy development across the region. One possibility is to impose a “border tax on imported goods made with significant climate pollution,” so consumer prices reflect the impact on the global environment. Similar safeguards could be leveraged to protect public health or food safety. Medical prices could be regulated by harmonizing patent laws between importing and exporting countries. And under more progressive agriculture regulations, consumer groups or farmers’ unions could prevent imports produced with pesticides or environmentally damaging processes. Protecting the staple-crop markets of small farmers on both sides of a trading border would help prevent the kind of mass northward migration crisis that NAFTA spurred in rural Mexico with the displacement of farming communities. 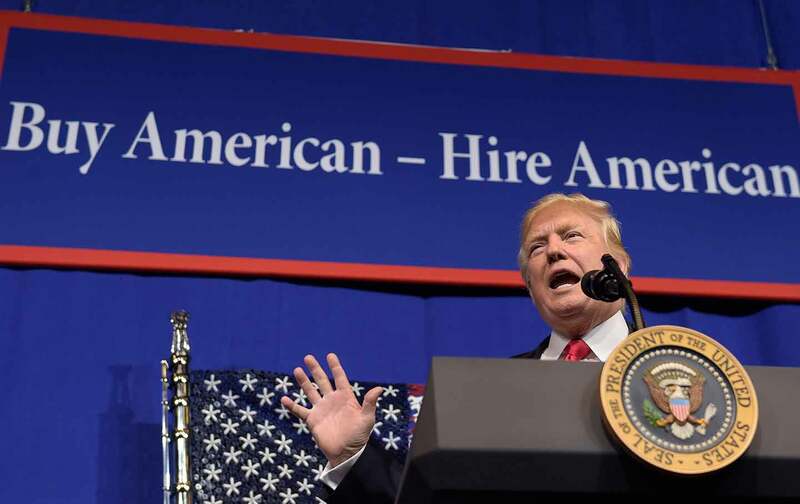 When campaigning, Trump claimed he would overhaul NAFTA to “bring back” outsourced US jobs, though his economic agenda has so far largely centered on corporate deregulation. He did reject the Trans-Pacific Partnership—a larger, more complex trade agreement covering the Pacific Rim—but overhauling a treaty that’s already on the books is a heavier challenge. With Canada and Mexico seeming reluctant to totally revamp the agreement, Trump has backed down from his earlier anti-NAFTA saber rattling. His recent handshake deal with China, which scored only tepid promises on currency manipulation and a few imports, further suggests he will prove an incompetent negotiator for the mother of all trade treaties. As Trump opens a Pandora’s box for revamping trade policy, activists know they’re dealing with the devil in the world of business and politics. But if Trump’s deal making fails, grassroots activists are ready to step in and drive a hard bargain on behalf of marginalized communities around the world, who have already lost under globalization and now have everything to play for.